The exterior components are made of Ti 6-4 (Gr 5). Self-sealing valve opens when the purge fitting of the Deck Purge Box is attached. This allows for simple, unhurried cleaning of the o-ring. Flats on the body make the purge port easy to disassemble for maintenance and inspection. A half-dove tail groove in the Global Ocean Design sealing cap helps retain the o-ring during installation. The Global Ocean Design body and cap portions that are exposed to sea water are made of strong and corrosion resistant Titanium 6-4. Each purge port has a unique laser engraved serial number. Each Global Ocean Design purge port is individually tested to 18,000 psi. The Global Ocean Design purge ports for spheres are shipped with all required mounting hardware (spheres). Each Global Ocean Design purge port comes with a set of spare o-rings. Each Global Ocean Design purge port is engraved with a helpful reminder on top to "Replace Cap" so the technician recalls to install the pressure proof sealing cap. 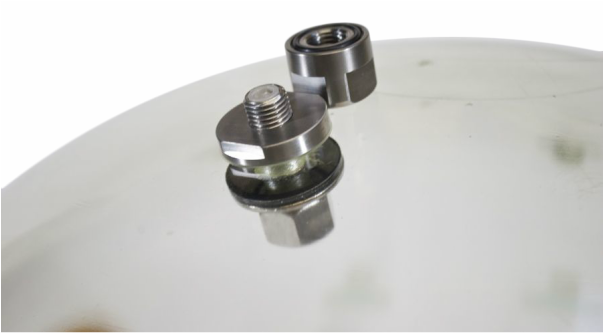 Purge ports are available in three styles: 1) retro-fit to existing Benthos and Vitrovex spheres; 2) standard clr 7/16" D holes (typical for many bulkhead connectors); and 3) for flat end cap and plastic pressure cases. Click on model number above for further details.